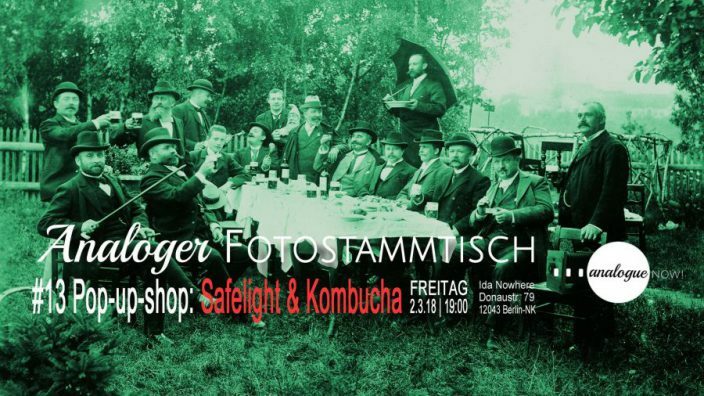 Analoger Fotostammtisch #13: Pop-up-Store: Safelight & Kombucha • analogueNOW! In cooperation with Safelight Berlin we are happy to invite you to our next Fotostammtisch: Safelight will have all of their stock of second hand cameras, accessories, and expired film with them. On top of that, you can leaf through limited (photo)zines, books and prints. Safelight Berlin is an online shop specialised in analogue cameras, lenses, expired films and darkroom supplies and accessories. Based in Berlin, Safelight was founded by two friends with a common passion: photography and everything that revolves around it. Come by and have a drink with us, there will be Kombucha, beer and music! Also there’s an OPEN CALL this time: You also have a zine or photobook you would like to offer to our public? Join us! Write an e-mail to Enrique.